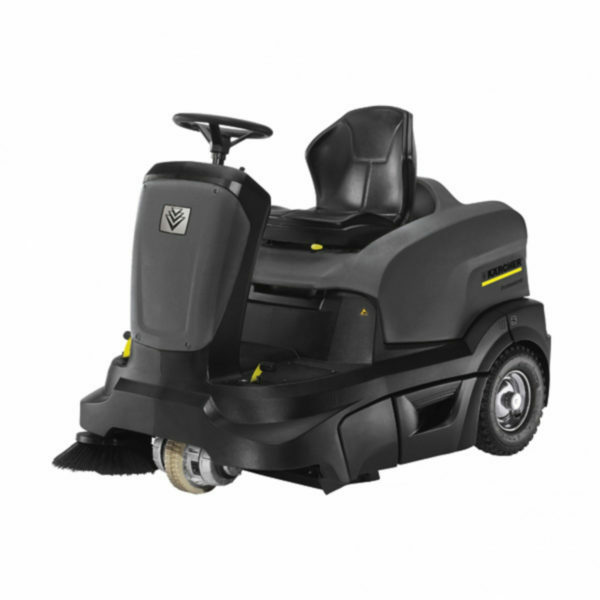 Compact ride-on vacuum sweeper with unique Tact filter clean technology for constantly high dust control. With 1.2 kW 24V electric drive and choice of low maintenance or maintenance-free batteries. The KM 90/60 R Bp Adv brings new technology to ride-on sweepers. Kärcher’s unique Tact filter clean system has been proven in dust extractor vacuums, and now provides constantly high suction performance on a sweeper for the first time. The Tact system automatically backflushes the dust filter to prevent it from blocking, meaning the KM 90/60 R Bp Adv always works at its maximum and provides unrivalled dust extraction capabilities. Featuring simple controls, 60 litre dirt capacity, excellent visibility and quiet, powerful, emission-free electric motor, the KM 90/60 R Bp Adv is easy and convenient to operate and offers excellent productivity for indoor and outdoor sweeping tasks. Choose between low maintenance or maintenance-free batteries. Highly effective filter cleaning for continuous dust-free operation. Compact filter size with long service life. Easy access to the filter. Logical and clear. All controls are clearly arranged and easy to access. Different practical connections for other accessories. Easy to carry, for example, a litter picker, brush or an additional container. Built to last, highly reliable. Additional components, e.g. spare canister or manual cleaning attachments can be securely fixed on-board.